French Champagne houses arrived in the late 1970s, experimenting with some existing regions and discovering others. Indeed, according to John Haeger, professor, author, and Pinot Noir expert, these houses actually saved Pinot from abandon in California, and are mainly responsible for the migration of Pinot into cooler sites. Their legacy is some terrific domestic sparkling wine originating from the deep end of the Anderson Valley, and cooler parts of Napa and Sonoma, among other places. But what of the Central Coast? In addition to Loring, Clos Pepe dabbles in bubbles, Brewer-Clifton makes a highly acclaimed sparkling Chardonnay, and of course Laetitia carries on the heritage of Champagne Deutz. The most famous name to get in the game, however, is Sea Smoke Cellars. 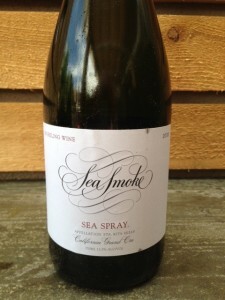 Sea Smoke, a producer of high scoring, highly allocated, cult Pinot Noir, launched a Blanc de Noirs called “Sea Spray” with the 2008 vintage. According to Victor Gallegos, the Director of Winemaking, they “knew they had the right raw materials…with great acids…to pull off a nice sparkling wine.” Those raw materials come from Sea Smoke’s estate vineyard, which is a self-declared “grand cru” consisting of about 100 acres of south-facing hillside land ranging from 300 to 700 feet in elevation. Is this the type of site that can produce a ripe but low alcohol base wine suited to sparkling wine making? Gallegos seems to think so. He calls Sea Spray a “grower-style” blanc de noirs, but admits that it is made in “an esoteric style.” Given Sea Smoke’s propensity for powerful, robust Pinots, one might be skeptical about the winery’s ability to create a well-balanced sparkler. Having tasted the final product, I think they have some more work to do. Even Gallegos admits over e-mail, “there is always room for improvement.” My guess, given the winery’s track record, is that it will improve, once Sea Smoke finds the right balance among its climate, soil, location, and vineyard techniques. We shall see in a few years – the next vintage of Sea Spray is 2011, currently en tirage. For his part, Loring acknowledges the challenges of working with Central Coast fruit and is realistic about what that means in the cellar. He tells me that they pick the grapes used in their sparkling wines at the same ripeness parameters as for their still wines, resulting in alcohol levels of around 15%. They “then de-alc the wines back down to 11% and add acid.” The goal is to have the “correct” flavors, even if a bit is lost during the de-alc process. (It’s not clear if Sea Smoke follows the same process, although it is notable that Sea Spray weighs in at less than 11% abv.) 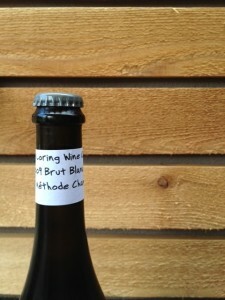 Like Sea Spray, Loring’s sparkling wine is still a work in progress. The bottles I sampled may have been disgorged too soon; Loring admits they could use more time on the yeast. But, as this is an experiment for them – probably no more than 100 or so cases per year – the learning process is part of the fun. In the end, that may be all the reason a Pinot grower needs to start going bubbly. Light gold in color. Not very vigorous bubbles. The nose is all creamy, ripe fruit. This is a big, heavy, full-bodied wine. Tons of red fruit – raspberry, sour cherry candy. The finish is surprisingly short, with a metallic edge. There is some potential here, but as yet unrealized. Even at an eye-opening release price of $80, it sold out in three days, so there’s obviously a market. For another take on these wines, visit Isaac James Baker’s blog.